Use as a sugar substitute for people with diabetes, hypoglycemia, dieters, and anyone who wants a natural alternative to sugar. A small amount of Stevia goes a long way. Ingredients: White Stevia Extract Powder. 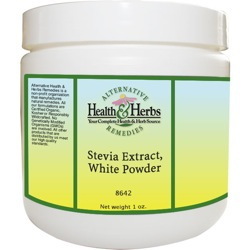 Stevia is hypoallergenic and contains no sugar, salt, yeast, wheat, corn, soy, milk, preservatives, or additives. Instructions: As a dietary supplement, mix 1/4 or 1/8 tsp. of the powder in 1 oz. of water or as desired.